Australian Jordan Mercer cruised to an uncontested sixth straight victory in the women’s unlimited prone category. 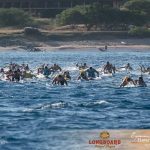 HONOLULU (August 1, 2016) – Athletes at the 20th Anniversary Moloka’i-2-O’ahu Paddleboard World Championships (M2O), presented by Kona Brewing Company, were graced with the blusterous downwind conditions that make the Ka’iwi Channel famous. 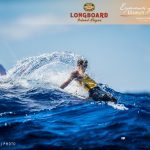 Setting records on the waves, Matt Bevilacqua powered to his second consecutive win in 4 hours, 29 minutes, 32 seconds in the unlimited paddleboard category. The 24-year-old Australian’s win crushes the previous record set by countryman Jamie Mitchell in 2011 (4:40:31). Mitchell recorded 10 consecutive wins over his M2O career. The Australian phenom Jordan Mercer (above) cruised to an uncontested sixth straight victory in the women’s unlimited prone category (5:32:42). This win puts her on a path to becoming the winningest woman ever at M20, establishing her own decade of dominance in the sport. Stewart McLachlan surged to his first ever win at M2O, beating fellow Australian Lachie Lansdown and two-time champ Jack Bark. McLachlan, 28, now holds the course record at 5:05:31 in the stock paddleboard category. At 18-years-old Abby Brown becomes one of the youngest champions in race history. The American’s time of 6:27:47 was enough to put her over the top of former stock paddleboard champs Carter Graves and Coleen Tessler. 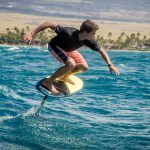 Lenny’s win bests that of rival and fellow Maui paddler Connor Baxter’s record of 4:08:08 set in 2014. 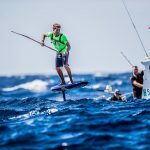 Kai Lenny, 23, put his record-setting stamp on M20 by winning the men’s unlimited stand up paddleboard (SUP) race in 4:07:41. 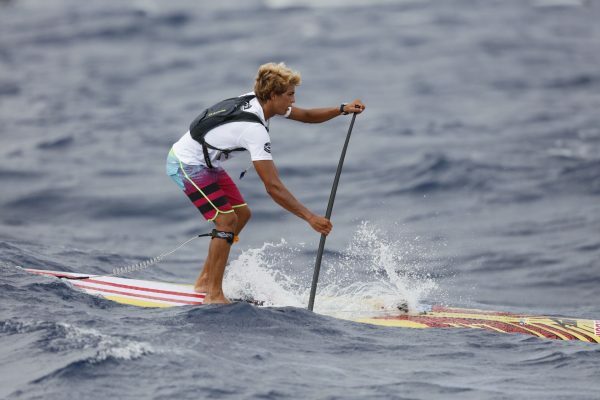 Lenny’s win bests that of rival and fellow Maui paddler Connor Baxter’s record of 4:08:08 set in 2014. Lenny also holds the record and title in the stock SUP category where he finished second overall in a time of 4:22:14 in 2012. Sonni Honscheid, 35, set a personal best in her third consecutive win at M2O (5:01:40). The German champ was just minutes off the unlimited SUP course record of 4:55:02 set by Talia Gangini in 2012. Niuhiti Buillard, 24, from French Polynesia took home the men’s stock SUP title in 4:40:50. The 28-year-old’s win is the third fastest time in the category. 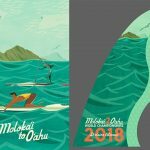 M2O valued partners include: Kona Brewing Company, Surftech, Hawaii Tourism Authority, Dukes, Patagonia, Garmin, Waterman’s Applied Science, Futures, Blue Rush, Dr Danger, Futures, WND & WVS, Dot Vision, SUP Think Tank, Ocean Paddler, BARK, NSP, Kaenon, RE Energy & Kona Deep.